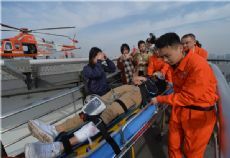 An air rescue drill was held in Chengdu on Oct 30 which saw the successful rescue of wounded personnel from a traffic jam, making Chengdu the first city in Sichuan province to have an air medical rescue system. Chengdu currently has one rescue point at Gang Tai General Aviation, which is only 200 meters away from the Sichuan Provincial People's Hospital and has the only rooftop helicopter landing pad in Chengdu's urban area. Another rescue point is under construction at the Chengdu Emergency Center. The operator of the air medical rescue is Shanghai King Wing Aviation Co, a class A general aviation company approved by the Civil Aviation Administration of China. During the past 10 years, the company has cooperated with over 800 hospitals and emergency centers in 28 provinces in China, forming a nationwide air medical rescue network. The AW139 professional medical helicopter used in the rescue was imported from Italy and is worth 135 million yuan ($19.4 million). It is equipped with three stretchers and all medical rescue equipment which would be found in a small ICU. It can respond to emergencies within a radius of 250 kilometers. Air medical rescues are three to five times faster than traditional medical rescues and can increase the success rate of treatment by 80 percent. With the large amount of medical staff members required for air medical rescues, the Sichuan Provincial People's Hospital selected eight professionals to join the rescue team. According to the plan, 30 medical staff members from different hospital departments will join the team within the next three years.